This Is About Power Trailer: Medici the Magnificent! Medici the Magnificent – Jacobo Pazzi – Photo courtesy of Netflix. Netflix has released the first-look trailer for its upcoming period drama, Medici: The Magnificent. The eight-part series centers on the great lords of Florence. Daniel Sharman stars as Lorenzo De Medici alongside Sean Bean as Jacopo Pazzi. Medici: The Magnificent premieres on January 25th. TELEVISION: Beyond Sherwood Forest – Robin Hood, Maid Marian and a Dragon! 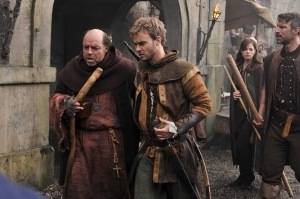 After more film and TV adaptations than any character other than Tarzan and Sherlock Holmes, Syfy has come up with a rather nifty fantasy version in Beyond Sherwood Forest [tonight, 9/8C]. Even before the opening credits, it’s apparent that this not your standard Robin Hood movie. In the first sequence, we see a young Robert [Rowen Kahn] practicing with a bow and promising a young Marian [Anna Louise Sargeant] that he will, one day, become the finest archer in Sherwood. Meanwhile, the Sheriff of Nottingham and his two deputies are chasing a dragon, which one of the deputies, Malcolm [Julian Sands, Warlock]] is sure he’s wounded. The dragon kills the sheriff and when the deputies follow, they come upon a young woman, wounded by an arrow. Young Robert arrives just in time to see Malcolm strike his father down and ride off with the wounded woman. Stargate: The Ark of Truth – Brilliant? No. Entertaining? Hell, Yeah! 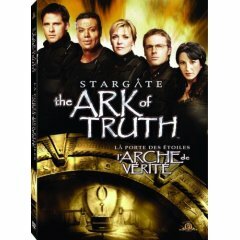 Stargate: The Ark of Truth – which hits stores on Tuesday – is the direct-to-DVD wrap-up of a number of loose ends that were left unresolved in the series finale of Stargate SG-1. Although Stargate Command was pretty sure they had managed to destroy the actual Ori, there no resolution regarding the evil ascended beings’ religious hierarchy – the Doci and the Priors [and being pretty sure isn’t the same thing as knowing…] – not to mention Adria.